It’s not the most exciting aspect of a phone, but it’s a vital one: charging. You can charge your phone using any Samsung-approved travel adapter, but charging speeds may vary depending on the charger. Use the charger that originally came with your phone, or use only Samsung-approved charging devices and batteries. Samsung accessories are designed to maximize battery life. Using other accessories may invalidate your warranty and may cause damage. Your phone is powered by a standard rechargeable Li-ion battery. 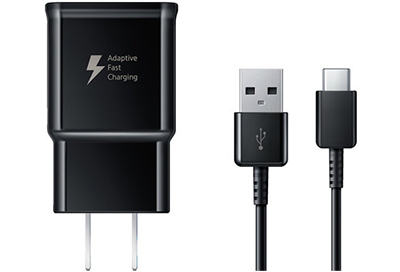 A two-piece wall charger (Adaptive Fast Charger and USB cable) is included with the phone. The battery comes partially charged. A fully discharged battery requires up to 4 hours of charge time. Rest assured, you can use the phone when using the charger that came with your phone. ➥ Purchase Adaptive Fast Charging Wall Charger. ➥ Purchase Fast Charging Wireless Charger. DO NOT use any other chargers other than Samsung-approved chargers. If you need to use and charge the phone at the same time, you must use the Samsung wall charger that came with your phone. The Samsung wall charger is required in order to properly charge. Using a third-party charger can hinder the charging of your phone and may cause battery issues if used long term. The charger that comes with your phone is 5.0V/2.0A and has SAMSUNG printed on it. When charging your phone, please keep in mind that the use of uncertified or counterfeit charging accessories (e.g., chargers, wireless charging pads, cables, USB-C adaptors, etc.) may cause safety issues that result in product damage. We strongly recommend that you use genuine Samsung accessories. When using wireless charging accessories, please be aware that any metal or magnetic materials (e.g., coins, magnetic cards) placed between the phone and the wireless charger may decrease charging efficiency or cause damage to the phone and charger. When using wired charging accessories, always check whether any foreign objects are in the connector or plug, as they may prevent charging or cause the charging accessories to overheat. How do I use the Maximum power saving mode on my Galaxy Note8?